A guide to the best, most accurate kitchen scales. A good kitchen scale is an absolute must-have for every kitchen. Although nothing can substitute for skilled intuition—add a dash of this and a handful of that, cook until golden brown and delicious—there are times when the precision a scale can provide is vital. Many baking recipes call for cups and fluid ounces, but no matter how experienced a baker you are, the cup of flour you weigh today will not be the same cup of flour you weigh tomorrow. This is because many dry ingredients, such as flour, cornstarch, and brown sugar, can easily be compressed or aerated depending on the whims of the measurer, how the goods have been stored, and possibly some black magic. Scales aren't just for all the would-be pastry wizards out there, either. They're a necessary tool for any serious cook as well, especially for determining ratios or servings. If you like your mirepoix to be two parts onion to one part celery and carrot, a quick check on the scale can guide you. More advanced recipes—such as those for charcuterie, in which perfect proportions of fat to meat to salt are everything—demand the use of a scale. Even in your day-to-day life, brewing coffee is made much easier with a scale, allowing you to forget scoops of beans and cups of water and just measure it all in grams. If you do decide to purchase a scale, the variety on the market today can make picking one a daunting task. We've set out to determine which scale is the best for all your kitchen needs by testing 13 models, ranging in price from $9.99 to $59.99, with maximum capacities between 11 and 17.6 pounds and resolution between 0.05 and 0.1 ounces. Although we wouldn't recommend using a kitchen scale to weigh anything under five grams (a jeweler's scale is the way to go for smaller amounts), a scale with higher resolution will be more responsive to minute, incremental changes in weight. A great scale should be accurate first and foremost, but also easy to clean, intuitively designed, simple to read, and convenient to store. These are the qualities that will have you reaching for a scale every time you portion meat for burgers or whip up a batch of fresh pasta. Consistently accurate, with a functional design and practical extras, this OXO Stainless Steel Scale came out on top again and again in every round of testing. Our winning scale went above and beyond as the only one to feature a pull-out display, battery-life and maximum-weight indicators, and the longest delay before the scale shuts off automatically. Its slim design makes it easy to fit it into any drawer, though it's still heavy and stable during use. The Escali may not have all the trimmings of the OXO scale, but at half the price, this durable yet lightweight scale is an excellent kitchen workhorse. It has a minimalist design, with simple buttons and an easy-to-read display. We found it to be accurate to the gram, with near-instantaneous readings and a long delay before auto shutoff. There are countless kitchen scales on the market today. We found scales that slide out of the side of a cutting board, scales that fold up Transformer-style to fit into a pocket—even scales that make health claims, like "Lose 10 pounds in one week by weighing what you eat!" It was an ocean to wade through, so we had to set strict rules for ourselves to determine what qualities were most important for the home cook. We limited our test to scales that had a maximum capacity of no less than 11 pounds. A six- or eight-pound capacity might sound like plenty, but once you've taken into account the weight of the vessel you're weighing your ingredients into, you can quickly begin to...tip the scales. Especially because many cooks weigh into glass bowls or saucepots, a minimum capacity of 11 pounds is a necessary requirement. Scales that displayed weights in fluid ounces and milliliters were also immediately ruled out. Significant confusion already exists between ounces (a unit of mass) and fluid ounces (a unit of volume), and we felt that a scale displaying these fluid units would only aggravate the problem. Although one fluid ounce of water equals roughly one ounce of water (1.04 ounces, to be precise), liquids can vary greatly in density. Believing you can use a scale to weigh six fluid ounces of honey or molasses is a mistake that could decidedly derail a dessert. We tested only models that display weights in units of mass—grams and ounces—not volume. We also looked for scales with reasonably sized platforms, ones that are large enough to easily fit a mixing bowl or bag of onions, but not so big that storage of the scale would become an issue. For us, this meant scales with platforms ranging in size from five and a half inches to 12 inches across in length. We tested only scales that included a tare function in the design. Pushing the tare button resets the scale to zero, allowing you to weigh different ingredients in the same vessel without having to do any math. Easy cleanup is key in the kitchen, where there are so many opportunities for messes. Many kitchen scales have raised buttons or displays with unsealed edges, increasing the potential to quickly muck them up with flour and oil, so they become impossible to clean. We gave preference to models with sealed buttons and fewer crevices for food to get trapped inside. To determine accuracy, we tested each scale with calibrated five-gram, 10-gram, 100-gram, and 500-gram weights. The weights were tested multiple times on the centers of the scales as well as each corner, to ensure that accuracy wasn't dependent on where the weight was placed on the platform. The majority of the scales were consistently accurate; only four displayed inaccuracies of between one and three grams. We also wanted to test whether that fine-tuned accuracy degraded when the scale was loaded with heavier stuff—for example, if you were whipping up a batch of Kenji's pizza dough and wanted to weigh sugar into the bowl you'd already scaled the flour into. To test this, we set a 750-gram calibration weight on each scale, then added the lighter calibration weights on top of that. We found that some scales displayed greater inaccuracies with this test; the worst performer was off by seven grams. Although most kitchen scales aren't designed to weigh minuscule quantities of ingredients, such as a teaspoon of salt or baking powder (Stella has written about this in depth), we decided to run a test to see if any of the scales could handle it, the assumption being that if a scale could accurately weigh a small amount, it would likely be more adept at measuring a pound of sugar. To test how accurate the scales were with very small amounts, we attempted to weigh a penny, which weighs 2.5 grams, on each one. Some scales read the penny as two grams, others three, while a couple of scales didn't register the weight of the penny at all. Finally, we tested each scale's accuracy at measuring small amounts incrementally. We weighed 40 grams of salt, one pinch at a time, to see if the scales could accurately measure it. While most performed well, a few were off by as much as 20 grams, and one scale could not even complete the test, repeatedly timing out before all the salt was measured. Our top picks not only performed well on all these tests, but were also capable of accurately weighing as little as two grams, which is far more accurate than you need for most tasks. We timed how many seconds it took for each scale to turn on. One scale took almost five seconds to fire up, while others were instantaneous. Our winners fell in the middle, with the OXO taking three and a half seconds and the Escali two seconds. Most of the scales took about two and a half seconds to activate. It makes sense for a scale to shut itself off to conserve battery life after a period of inactivity, but it can be exasperating when it's programmed to do it too soon. A scale turning itself off while you're mid-recipe, just because you stepped away to get another bag of flour or stick of butter, is enough to make you throw it against the wall. Even worse is one that has no memory function and resets to zero after shutting down on its own. It was important for us to pick a winner with both a reasonable wait time before the auto shutoff and the ability to remember the weight of whatever is on the scale when it's turned back on. Some of the scales' auto shutoff would kick in, annoyingly, after just one minute, while our top pick lasted the longest, at six minutes. For a tool you want to reach for over and over again, a user-friendly interface and intuitive design were imperative. Most of the scales were very similar in the design of their buttons and display. The on/off switch typically doubled as the tare button when held down for a moment versus quickly tapped, and the second button switched between metric and customary units. A few scales took a more inventive approach with button placement, much to our testers' confusion. The button most often used is the tare function, but one scale had it placed so close to the on/off button that we often ended up accidentally turning off the scale. Though switching between metric and customary should be a similarly simple and accessible function, some scales required the use of a toggle switch beneath the unit, or even hidden inside it. It was important for us to find scales with displays that were easy to read, so we looked for either high contrast or backlit displays with clear fonts. But large, easy-to-read lettering and a vibrant backlit display are useless if you can't see the display under a large bowl. Often, wide bowls or pots make it impossible to read a scale, so we measured the distance from the center of each scale's weighing platform to the center of its display. Scales with more distance between the two ranked higher in our testing. Several scales measured as little as three inches between the platform center and the display. This short distance, coupled with a low-profile design, made it extremely difficult to read the display with even a small mixing bowl on top. Our best performer had a pull-out display that extended the distance to a full eight inches, allowing the tester to easily weigh ingredients into wide mixing bowls and large pots without ever struggling to read the results. To test how easy each scale was to clean, we buried it in flour, then took note of how readily it wiped clean with a towel. Unless you're cooking in a dust bowl, your scale will never encounter this volume of dirt, but it gave us a good understanding of which models had an inordinate number of nooks and crannies for grime to build up in. Some scales had removable plates, allowing you to wipe away any flour that snuck underneath. It was important to pick a stable scale, too—one that didn't annoyingly tip or slide around the counter every time you pressed a button. Many of the lightweight scales easily fell over and bounced around on the counter whenever we tried to press tare or change units; this was especially noticeable in ultra-slim models. It resulted in the reading fluctuating by between five and 10 grams every time, and the scale often not returning to the correct weight when it finally came to rest. The Escali Primo managed to successfully incorporate a lightweight design without suffering from this defect. The primary function of a scale is to consistently and accurately weigh ingredients, so inaccurate scales were immediately out of the running. Our winning scales were the most accurate, and also easy to clean and easy to use. They came in on top through all of our testing. We preferred simple designs and displays, which minimize confusion. When you're working at the fast pace often required in a kitchen, trying to find the tare button on your scale is a frustrating waste of time. Our winners had the longest delays before auto shutoff as well, and stable designs that prevented the scales from moving at the mere press of a button. Typically, when any product is advertised as having extra attachments or bonus features, they're cheap gimmicks that don't add much real value. With our winning scale, every extra feature has been developed with the cook in mind. The OXO offers the best display, with a backlit option and high-contrast indicators, and it was the only model we tested that has battery-life and maximum-weight indicators, saving you from the frustration of a dead scale mid-recipe or the risk of damaging the scale through accidental overloading. It also features a pull-out display that allows clear viewing even when wider receptacles are sitting on it. With its removable stainless steel platform, the OXO was the easiest scale to clean of the bunch. One could weigh raw meat directly on the scale, then remove the platform to hand-wash for guaranteed sanitation. In the flour test, we were able to remove the platform to wipe out every last speck of flour. The OXO scale had the longest delay before auto shutoff, at 30 minutes, though it goes into automatic sleep mode after six minutes. While in sleep mode, the scale retains memory of what you last weighed until the 30-minute auto-shutoff point. This was the only scale with memory, which proved to be incredibly useful when we were interrupted during cooking. At two pounds, the OXO is one of the heavier scales we tested, a weight that can be cumbersome. The scale also had one of the slower start-up times (three seconds long), as well as a slight lag while we dosed out a series of ingredients. As we used the scale repeatedly throughout the day, this became bothersome. Our biggest gripe with the scale is that it displays ounces in fractions rather than decimals; luckily, OXO has informed us that the newer, 2018 model has eliminated fractions and uses a decimal-only display. We loved the simple, lightweight design of the Escali Primo. At only 11 ounces, it's a snap to grab and always have by your side. Though light, it managed to be stable thanks to its skidproof rubber feet and square base. The basic display and interface are effortless to read and use. 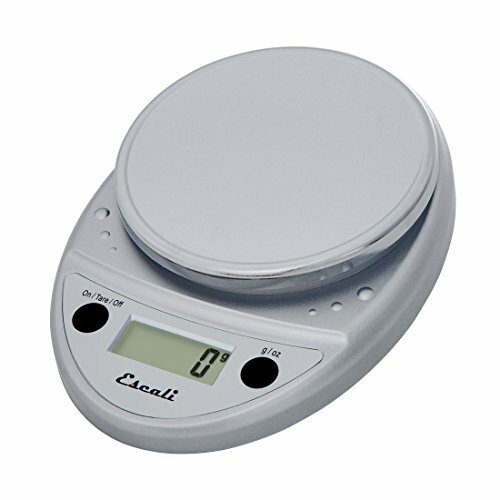 The scale features only two buttons: one to change units, and another doubling as the on/off button and tare function. Providing accurate measurement in both metric and customary units, it has all the basics. The Escali Primo had the second-longest delay before auto shutoff, at four and a half minutes. There were a couple of scales with similar designs and similar performance at lower prices, but they had only one-minute delays before auto shutoff, a flaw we could not get past. With only three and a half inches between the center of the platform and the display, weighing in larger bowls or vessels can become problematic with this scale, despite the platform's slight elevation. The buttons on the scale are not very sensitive and require the user to press down hard.